Roller Blinds, Always A Hit! 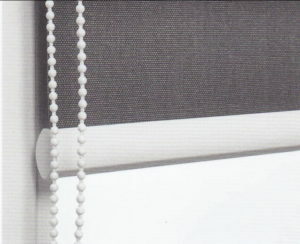 Generally speaking, roller blinds come supplied with white plastic chains. Additional colors are available from certain manufacturers: black, cream, grey, and metal. The Decor Connection started supplying metal chains as standard a while back. 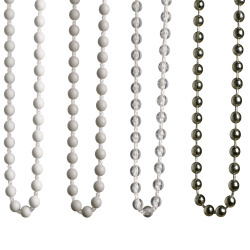 Metal chains, besides looking modern and elegant, provide more stability and durability than their plastic counterparts. Some chains have weights at the bottom, while others do not. There are hold-down cleats that are perfect to keep the chain out of the way and are a great safety feature if there are children in the home. Some customers worry what the hardware looks like on a roller blind. Rest assured the brackets are minor fixtures that are not the main focal point of your blinds. Normally a blind that is applied Face Fix comes with bracket covers that hides the outside portion of the bracket. Some manufacturers are able to color coordinate the brackets to the color of the blind, while some supply white brackets as standard with all material options. Whenever two roller blinds share a reveal there will inevitably be a gap between them. This gap is usually around 3cm up to about 4.5 cm. Usually we have options that decrease the space to around 1cm. 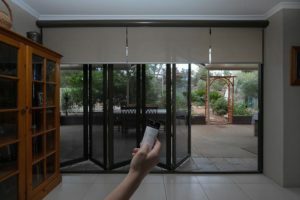 This is great for blockout blinds as well as times when customers do not want anyone to be able to see into the room from the outside. You can control two blinds on one chain as well! Many customers want to automate their homes, so why not also the blinds?! Motorization is an easy process. The motor is placed in the tube of the roller blind and connected to a remote control. We pre-program the remote to have “favorite” settings. Perhaps the customer always wants certain blinds to go up and down together. Or maybe two blinds over a sliding door? A remote comes programmed to raise and lower all blinds in the home at once! There are remotes specifically for each system we carry. There are 5, 10, 15 channel remotes that allow for maximum programability. Some remotes even come with a variety of colors to choose from! Sheerweave Roller Blinds are a perfect option for rooms which either get a lot of sun, or where privacy during the day is required. Not only are they beautiful and elegant but they are also incredibly durable and wipeable as well. Sheerweave Rollers blockout most of the harmful UV rays of the sun. This means that your floors and furniture are not at risk of fading. Another great feature is that they reduce the glare on TV and computer screens. Customers love these blinds in TV rooms and offices. 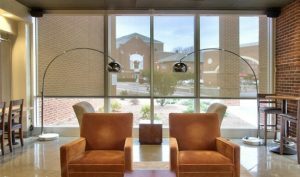 These blinds allow in the natural light without disturbing the screen user. Not all Roller Blinds are good candidates for your space. 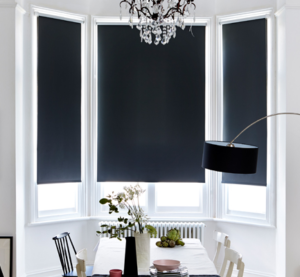 In a bathroom or kitchen, where the blind doesn’t fit into the window reveal, a Roller Blind might interfere with pipes running in the walls. The customer would need to have a plumber sign off first that the pipes will not be in the way of our screws. In a bathroom or kitchen (or any space where there is excessive moisture) only Blockout or Sheerweave options are recommended. We want to ensure the blind you choose is wipeable and won’t be prone to water-damage in these locations. 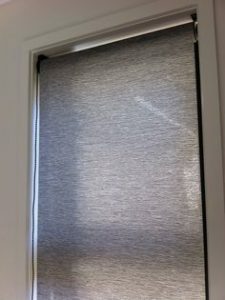 Light filtering means that the blinds don’t necessarily block all the light behind it but they do allow the user privacy when they are in the closed position. There are seemingly endless selections of Light Filtering Rollers. From soft colors and simple weaves to bold prints and more textured fabrics, we surely have the right Light Filtering Roller Blind for you. Blockout Roller Blinds come on a number of textures, colors, and materials. From PVC to designer fabrics, we’ve got all colors. Some are wipeable and some need to be dusted regularly to be kept in good shape. Blockout options are the most popular in bedrooms. The actual material does not let any light penetrate it. The only way light gets in is through gaps on the sides. In these cases we always give the option of applying the blinds above the window. (“face fix”). With the new tandem or double bracket, we can now easily affix two roller blinds to one window. These brackets allow a customer to choose a sheerweave and a blockout option for versatility and practicality. There are two types of these brackets so we will be sure to advise you about which one is best for your space. We carry Outdoor Roller Blinds in Sheerweave and Clear Plastic. Both options provide protection from the elements for your outdoor enclosed patio. Sheerweave Roller Blinds come in a few different “openness” percentages. The most common sheerweave is 5% open. They are also available in 1%, 3%, 10%. 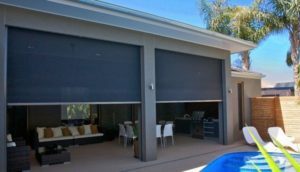 Outdoor Sheerweave Blinds are higher percentage “openness”. Plastic Roller Blinds are available in clear or slightly tinted. The tinted option works like a pair of sunglasses, allowing you to see out without the harshness of the strong African sun. Both options come standard with hold down clips. They also are available with a side channeling system to decrease the wind factor. There are a ton of different textures and colors that will definitely suit your house and decor. There are a number of factors that our talented team of installers consider when determining which screw to use to affix your Roller Blind. Some houses have plastering/cementing that is problematic. In these instances we might need to use non-factory-standard screws. Our team of installers comes prepared for most eventualities. Imagine a Roller Blind as a roll of roller towel. You have the option of allowing the material to come off the front of the roll or, alternatively, the back. When the material comes off the front of the roll, we call it “waterfall.” Waterfall-ing is preferred when there is a slight obstruction in the way of the blind. Also, some materials have a lining on a back that is different to the color on the front. In these cases we don’t want the back of the material to show over the roll! For corner windows, waterfall-ing the blinds decreases the gaps between the blinds. Some customers just prefer it this way as well. 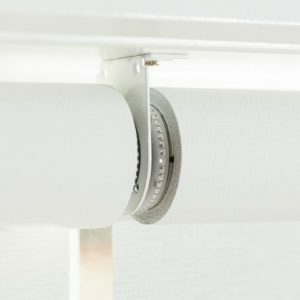 The bottom bars of roller blinds are either plastic or aluminium. They come either half-wrapped with the material folded up on itself or the plain metal at the bottom. Often times we can color coordinate the aluminium bottom bar with the blind itself. Long And Narrow windows are problematic for roller blinds. The roll tends to pull to one side when raised so you’ll need to use your free hand to ensure the blind doesn’t get caught in the mechanism. As we mentioned above, not all Roller Blind materials are ideal for a bathroom or kitchen. You don’t have to worry because our friendly sales staff will inform you of this at the time of quotation. Bay windows are also tricky. 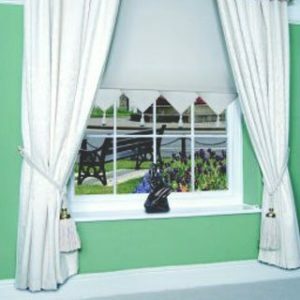 A roller blind in a bay window or corner creates a gap between the blinds. Because the brackets take up a bit of space, it means we can’t decrease this gap by too much. That’s why we tend to “waterfall” the blinds in these cases (see above). Space is an issue with Roller Blinds as the brackets require anywhere from 55mm. to 120mm. to be installed, depending on the size of the blind. 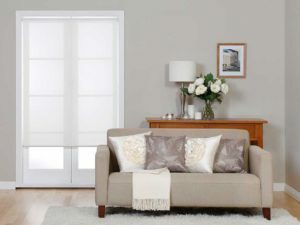 There are a variety of add-on options to Roller Blinds. Each manufacturer has the ones they offer and ones they don’t. 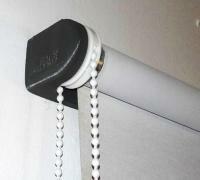 One option is hold down magnets which keep the Roller Blind secure even with a bit of wind. The blind won’t flap around, making a clanking noise. The downside is that if you forget to disconnect the magnets and attempt to raise the blind, you risk pulling the brackets out of your wall! Another option is either a side channel or side-wire-guide. 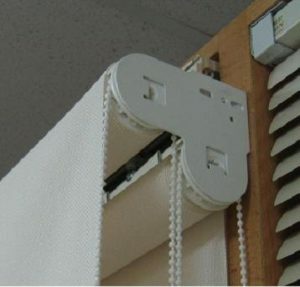 These allow the blinds to be held securely in place no matter how much they are lowered or raised. Hold-down-cleats (see above) allow the chain to be held securely in place for safety and for neatness. Wood Valances are also an option for customers who don’t want the plain look of the roll and brackets. The valance allows you to hide the roller behind a color coordinated piece of wood.